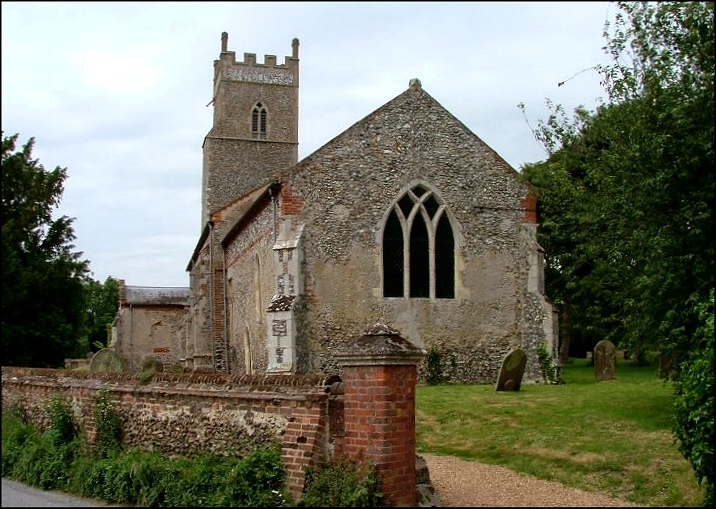 The area between Norwich and Fakenham, either side of the busy A1067, is a happy place to be a church explorer. 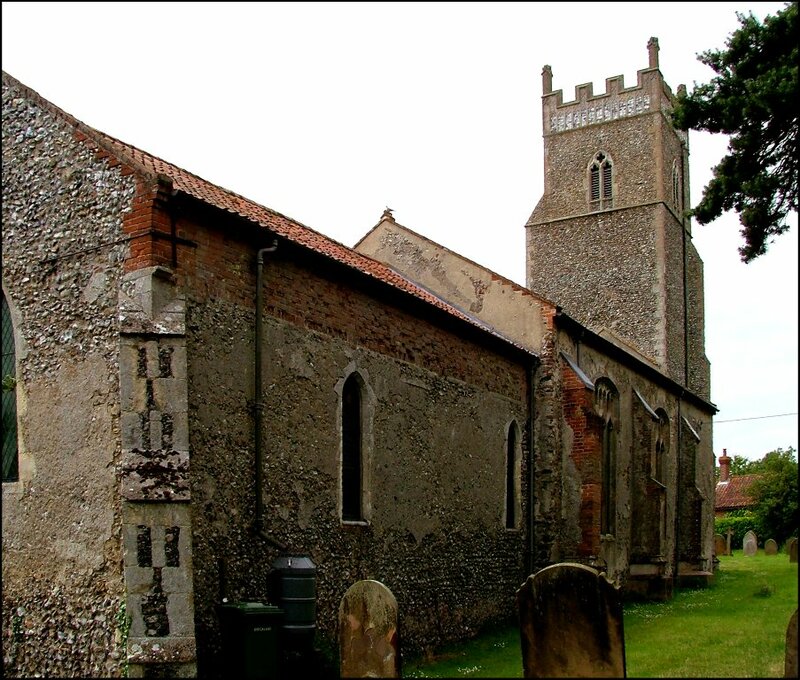 Five miles or more either side of the road, almost all the churches are either open or accessible, and some of Norfolk's best and most interesting churches are in the area. The road actually splits the village of Foxley in half, and not in a good way. When it was rebuilt in the 1990s, the road managed to bypass most of the settlements in its path, but here at Foxley it drives right through the middle, dividing the village into two quite separate parts. At busy times of the day it can be difficult to get from one to the other. The church is on the north side, along a narrow lane among the older houses. 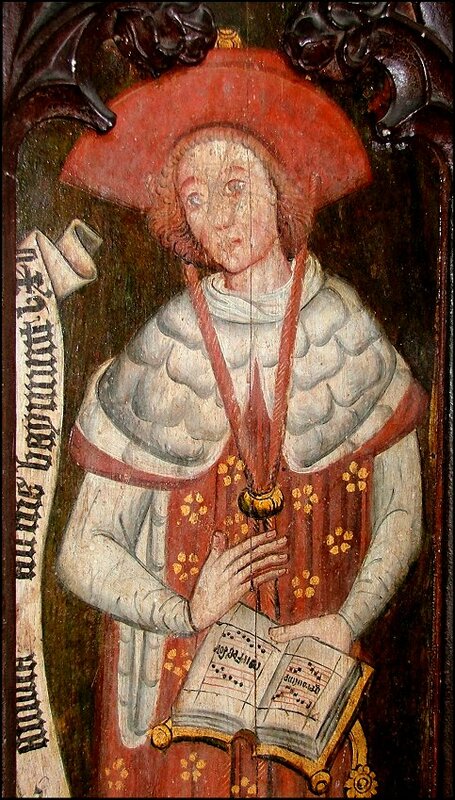 I have always been fond of the setting of St Thomas. Its narrow, walled graveyard above the village street, and the old houses that pack closely to it, give it a real sense of rural England, but of the business of the countryside rather than of its remoteness. 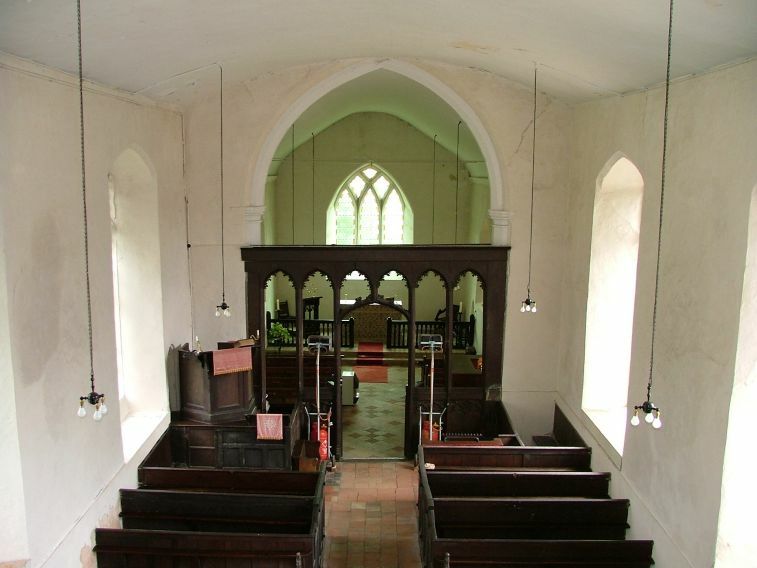 It is a typical small East Anglian village church. 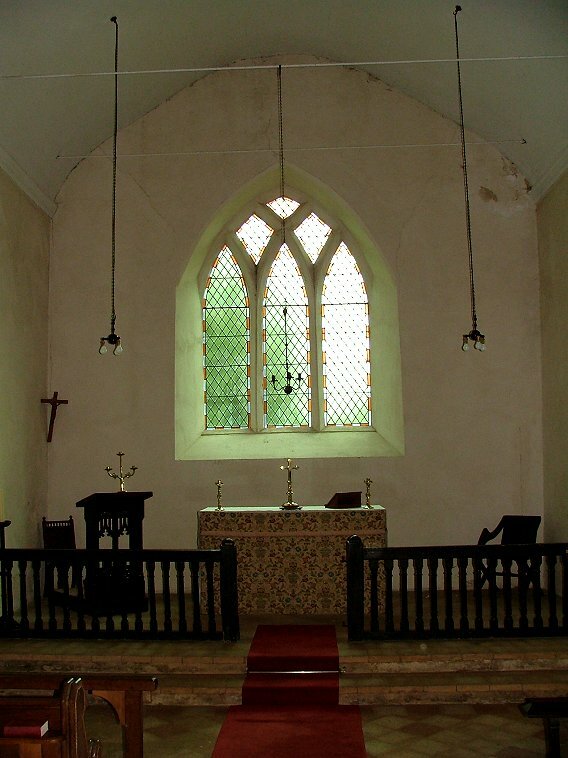 The building itself is very simple; not much happened here during the great East Anglian church rebuilding days of the 15th century. 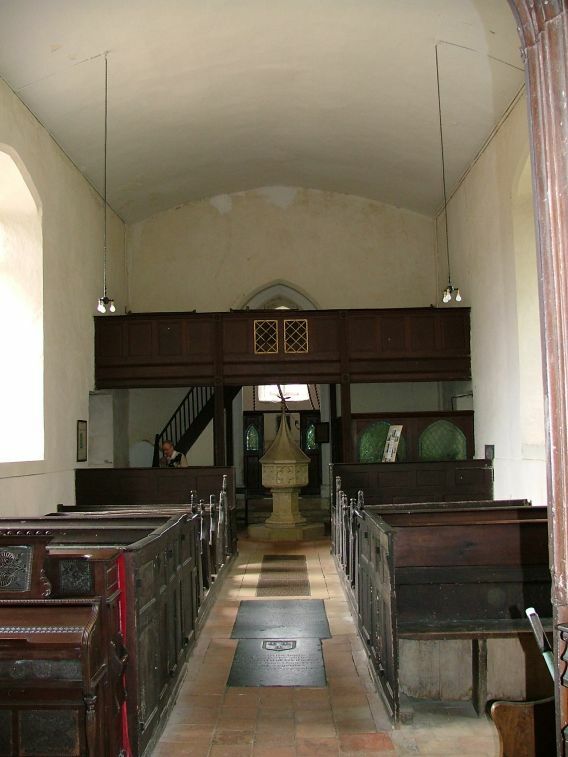 The chancel is 13th century, the narrow tower and nave a little later. There are some pleasant red brick details, and the big porch was given a rather alarming 19th century interior decoration, which has now faded. My fondness for St Thomas had been tested by the fact that, in four visits over some five years, I had never managed to get inside before. However, the keyholder notice now lists no less than three keyholders, so you stand a fair chance of finding one of them in. The key, incidentally, is one of the biggest I've ever borrowed in the county. Even without the history, St Thomas is a particularly lovely church to step into. It is light and airy, with a feeling of being tall, the white walls setting off the simple furnishings. 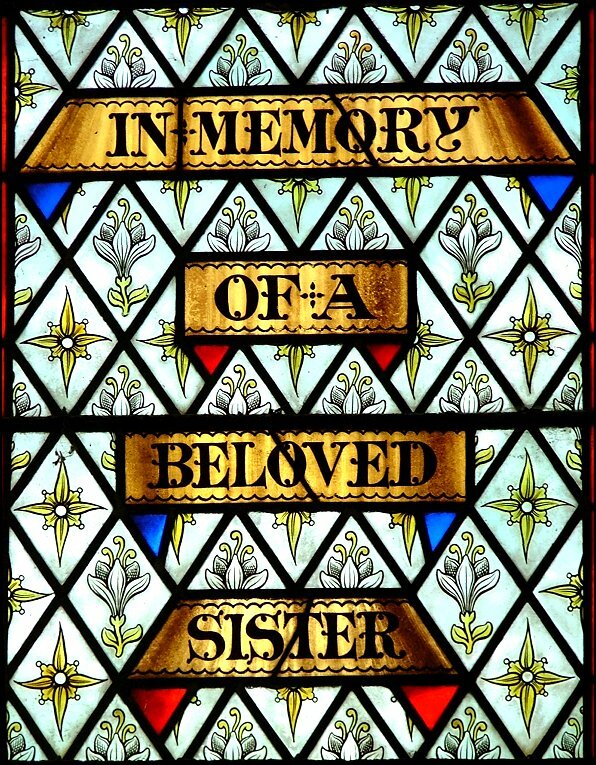 Clear glass fills the east window, flooding the chancel with light, and the brick floors are a delight. 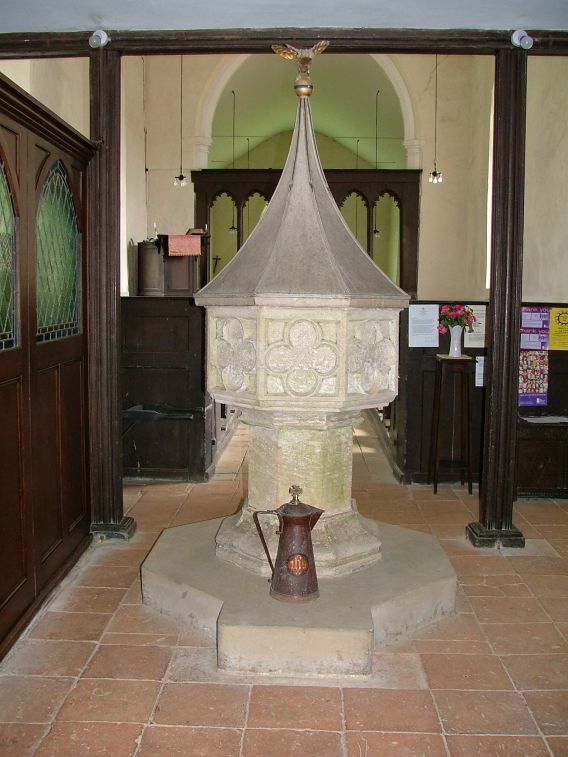 There is a fine west gallery, and the font with its 17th century cover sits beneath it. 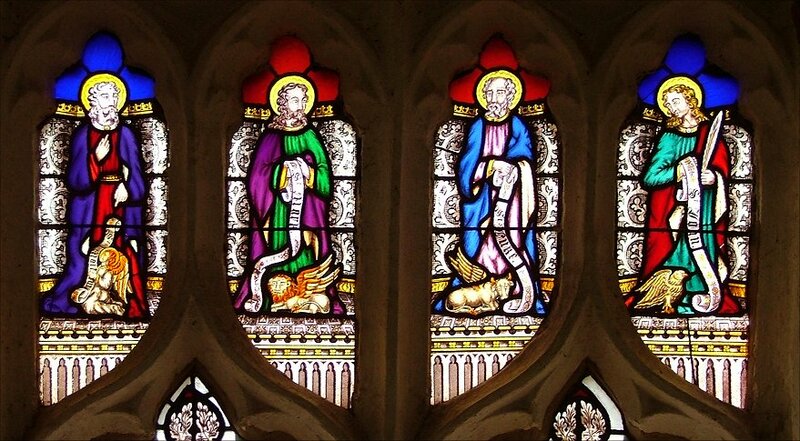 There is some fairly early Victorian stained glass depicting the four Evangelists in what is still really a pre-ecclesiological style. 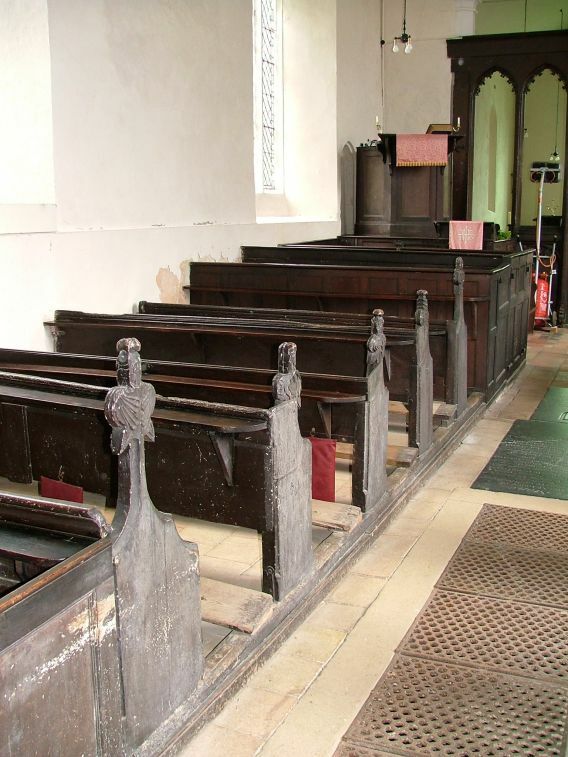 The benches are rustic, local creations of the 17th century, and everything conspires to offset Foxley's great treasure, the late 15th century rood screen. At first sight, it is as simple and understated as the church. Indeed, if you see it for the first time with the gates open, you might not even notice it. But there are a number of things about it that mark it as being of outstanding interest. The first of these is the gates. When you close them, they form a rank of four superbly painted figures. 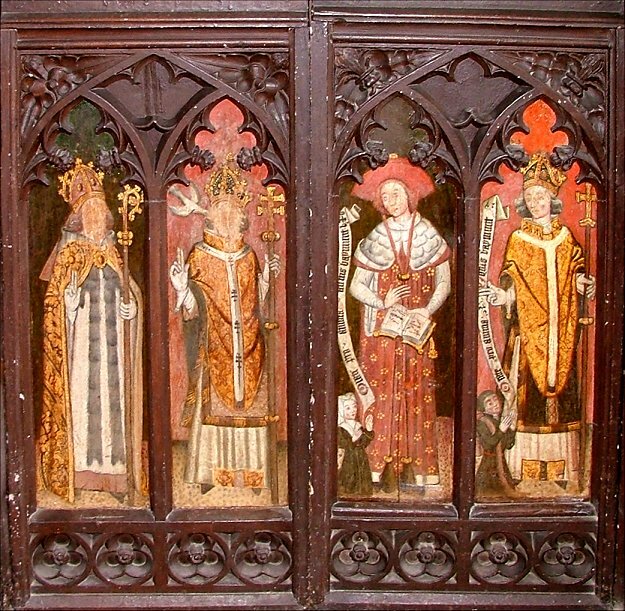 They are the Latin Doctors of the Catholic Church, Saint Augustine, St Gregory, St Jerome and St Ambrose. 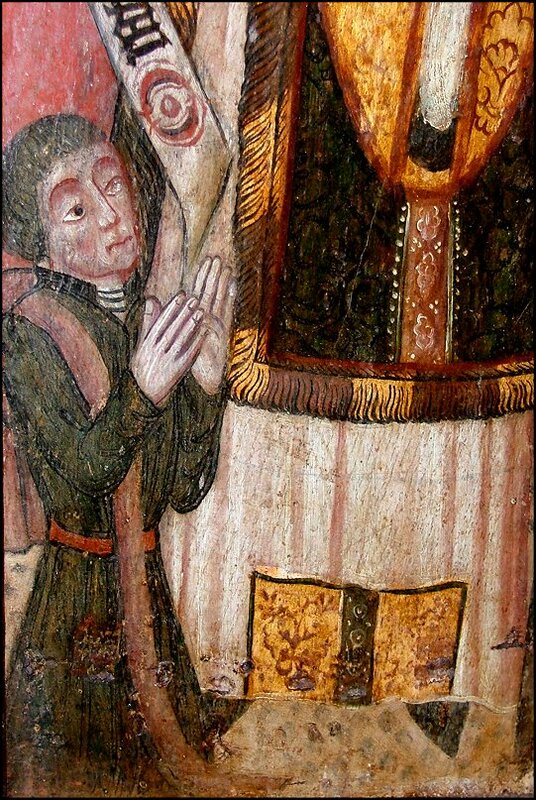 St Jerome in particular is delightfully rendered. He holds an open music score, and I only wished I knew enough about medieval notation to be able to work out what he is singing. 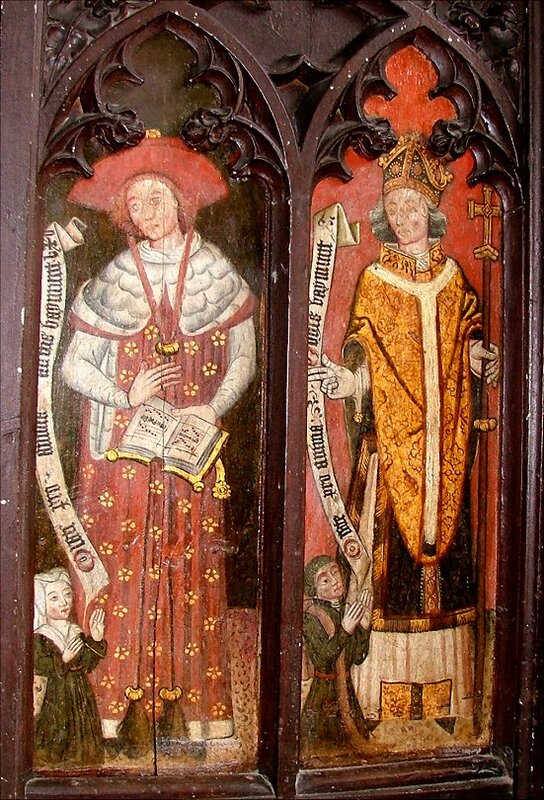 At the feet of St Jerome and St Ambrose are two further figures, a man and a woman. These are the donors of the screen, John Waymont and his wife. 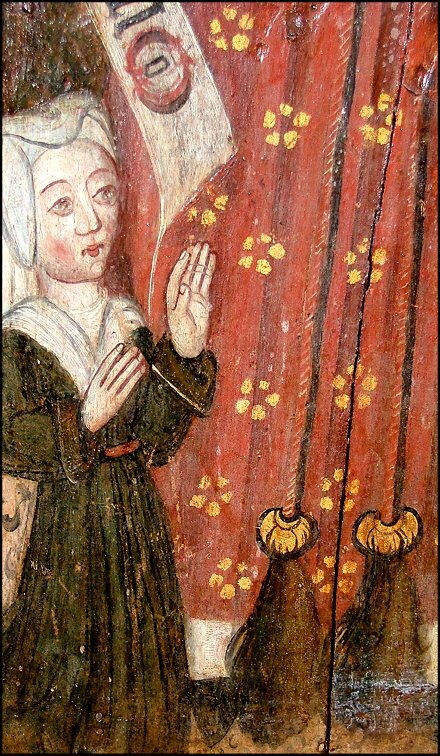 Scrolls that unwind from their mouths ask us to pray for their souls. And there is something else, which you might miss unless you look for it. The upper part of the screen has been sawn off at some point, and then reattached. 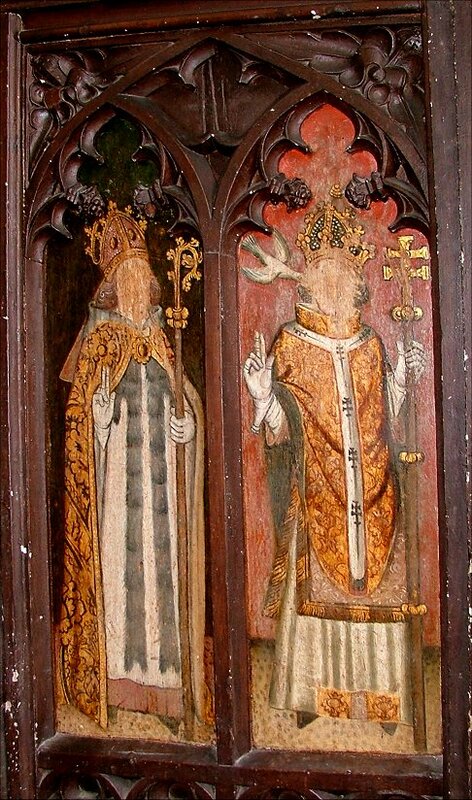 Now Mortlock suggests that the cutting down was done during the furious vandalism of images promoted by the boy King Edward VI in the late 1540s, and the repair came the following decade under Mary I. 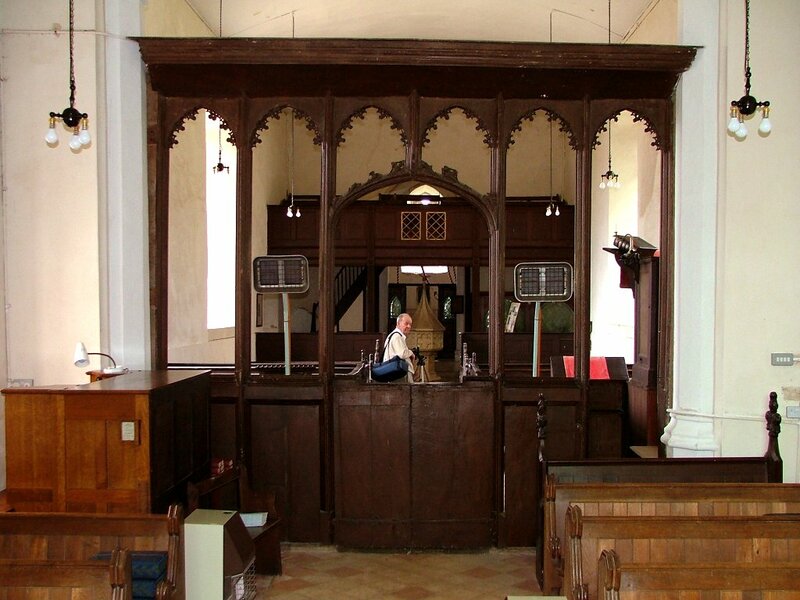 This may be so, and Tom Muckley had recently sent me a quote from the book Medieval Rood Screens of the Southern Marches which states that the rood-screen at Foxley, Norfolk, cut down to the wainscot during the reign of Edward VI, had its upper half reinstated during the reign of Mary. 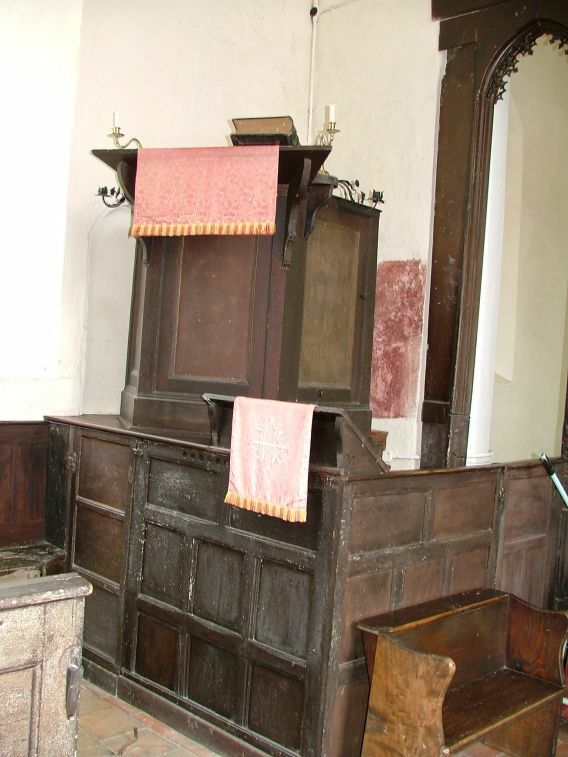 The screen still stands today, the metal strap plates fastening the standards back together clearly visible. 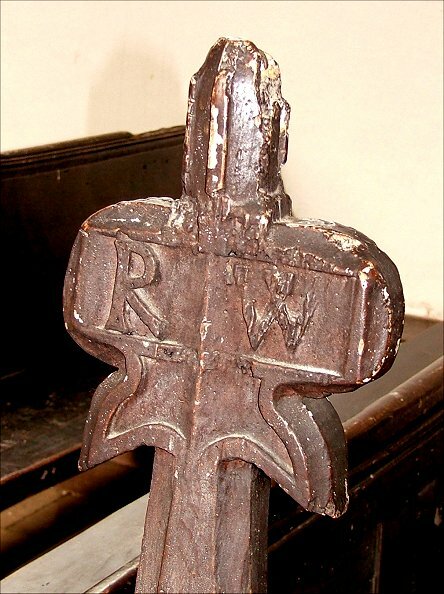 As I say, this may well be the case, but unless there is evidence for it which I have not seen, I am going to suggest another possibility, that both the cutting down and the raising up were done later, during the early years of the reign of Elizabeth, probably in the late 1550s or early 1560s. While the new regime demanded the removal of roods and rood lofts, the screens themselves had to stay. 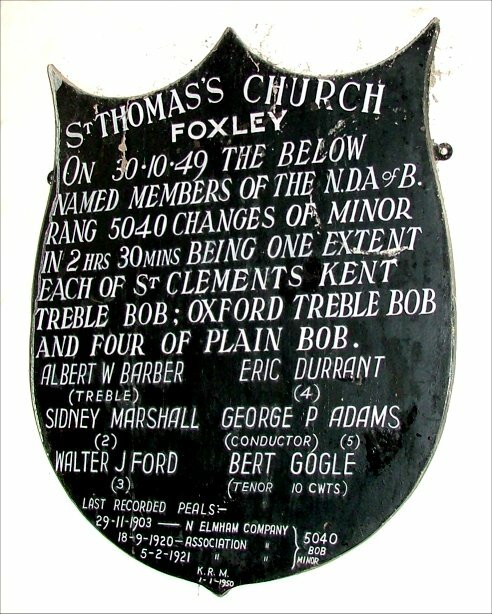 This injunction appears to have been misunderstood at first in several places, and I think that Foxley may well have been such a place where over-enthusastic reformers had to make good their iconoclasm. 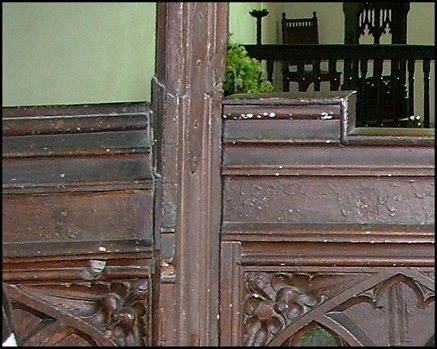 A 16th century temporary repair, perhaps, which survives to this day.